Would you suggest using cartridge refills? Meet Black, Cyan, Magenta and Yellow! Are these drops of toner costing your business too much? Are you looking to reduce your printing costs? HP LaserJet high capacity print cartridges and multi-packs save you time and money. The #1 brand in toner is the #1 value. 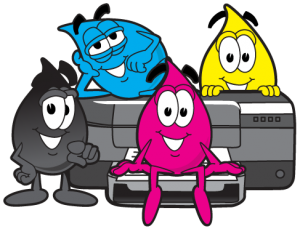 We’ll work with your business to come up with the best combination of economical printers and toner. Printer supplies from HP, Canon, Epson, Kyocera, Dell and many more. Manufacturer rebate programs and incentives to receive gift cards and free products. Free local delivery of printing supplies with no minimum order requirements. Lower prices than local superstores and nationwide internet companies. Serving commercial, industrial, educational and residential clients with no minimum order requirements. Let us help your business today! Check out or Printing Solutions page for more details. You can also find your supplies for HP or other manufacturers here on our Finding Supplies page. If you already know what supplies you need, check our our online store.